William Croft was born on 2nd April 1782 at the Croft's home at Bootham, son of Stephen Croft and his wife Frances, daughter of Samuel Clarke of Askham Bryan. On 14th April he was baptised at St Michael-Le-Belfrey, York. Whilst the Squire of Stillington's son and heir Harry went for a soldier William joined the Royal Navy in 1795 aged thirteen. His first ship was the Amazon, a 36 gun frigate commanded by Captian Robert Carthew Reynolds. Croft's first action was in January 1796 when the Amazon joined the Indefatigable under Captain Sir Edward Pellew* in the capture of two French ships L'Unite and La Virginie. Another joint action with the Indefatigable, a ten hour running battle with Les Droits de l’Homme during which three men were killed and fifteen wounded, caused the Amazon to run aground near I'Ile de Batz off the coast of Brittany. Captured, Croft spent some months in French hands until his release in 1797 when he rejoined the navy with the rank of Midshipman. Croft served as a midshipman on the Centaur under Captain, later Admiral, Markham. A lifelong friendship was forged between Croft and Markham during this time with Markham later using his influence to further Croft's career. During his time on the Centaur Croft saw action at the Capture of Minorca in 1798. His next move, in 1801, was to the 80 gun Foudroyant, Nelson's former flagship, commanded by Lord Keith. Serving ashore in Egypt with a naval attachment later that year Croft was present at the capitulation of Alexandria. With the Peace of 1803 Croft moved from the Mediterranean to serve on various ships witnessing the bombardment of Curacoa. By April or May 1804 he was commanding his own ship, the brig Vigilante. He says in a letter to Markham, written at Stillington, that at first he turned down the post of Commander as he had suffered a very serious attack of yellow fever whilst sailing from the West Indies and the ship's surgeon had recommended complete rest. 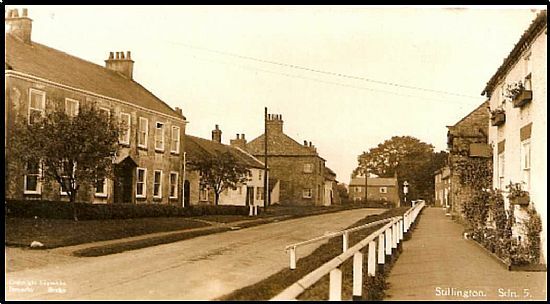 On 26th March 1805 William married Harriet Plumer at Bilton in Ainsty. She was nineteen years old and daughter of Hall Plumer of Stockton Hall, and niece of Sir Thomas Plumer, Vice Chancellor of England and Master of the Rolls. They had eleven children, five sons and six daughters. Click here to find out more. From February to September 1807 Croft commanded HMS Alacrity, an 18 gun brig-sloop built by William Row at Newcastle and launched the previous year. Croft was her first captain. She served in the Baltic seeing action during the events which led to bombardment of Copenhagen and the subsequent capture of the Danish fleet. This is a largely forgotten piece of British history, possibly because it is not one of Britain's finest hours! By the time the British fleet had captured Copenhagen and the Danish fleet Croft had been relieved of command on his promotion to Post Captain. From 1810 to 1813 he served as the regulating officer for Hull, after which time he was unable to find employment in the Navy becoming an officer on half pay. However, he still moved up the ranks achieving the rank of Rear-Admiral by 1841. * Pellew was fictionalised in the Hornblower series of books by C. S. Forester. 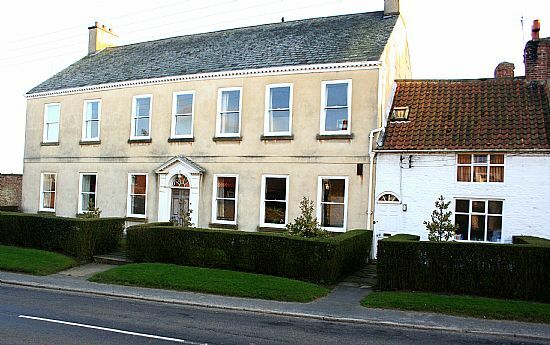 Croft is famous in Stillington for the house he and his family lived in. It was renamed in his honour, 'The Admiral's House', previously it had been named 'The Villa'. It was bought by William's father, Stephen, in 1806 from Richard Terrick Stainforth. Stainforth's great-aunt Frances Faceby nee Stainforth had begun the rebuilding of the house in her widowhood, converting two houses, a malt kiln and brewhouse into a much admired and impressive residence. On her death in 1763 she bequeathed her new ' mansion' to her brother William Stainforth, a York wine merchant. He continued the improvements. On his death in 1782 in turn left it to his eldest son, another William, who died at a relatively young age and unmarried only two years after his father. It then passed into the hands of his brother, Captain George, and his wife Ann, who were newly returned from America after losing their property, a large estate near Princeton in New Jersey, during the Revolutionary Wars. After George's death in 1790 the house Ann lived in the house, bought a property next to it in order to extended it and added a new coach house in 1805. Shortly after that her son Richard decided to sell the property. 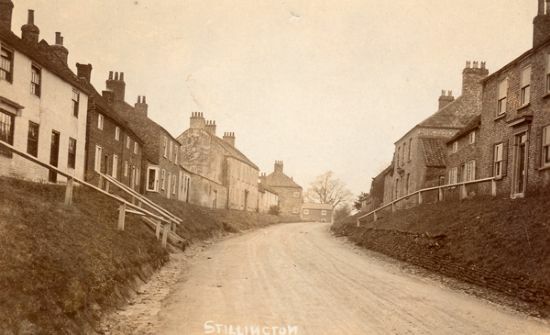 He had no interest in living in Stillington and had set up home in Huttons Ambo. Ann moved to live in the Stainforth's house in York. The large property was ideal for William Croft and his new wife. They undertook much modernising of the house after William's semi-retirement. A Stillington legend says that Admiral William wanted to recreate Stillington Hall, (or even out do it! ), in rivalry with his brother Captain Harry, owner of Stillington Hall. A wonderful garden was created. At local country shows the head gardeners of Harry (really of his wife Elizabeth who was a superb gardener) and of William, were frequent competitors. Croft was promoted to Rear-Admiral of the Blue in 1847. Five years later he achieved the rank of Vice-Admiral. Admiral Croft was also treasurer of the North Riding from 1829-1856. Harriet Croft died on 3rd November 1864 aged 79 years at Wetherby. She was buried on 7th November 1864 at Stillington. Admiral Croft died in 1872 aged 90 in his house at Stillington and was buried on 5th May at Stillington. SOURCES: Stillington Parish Records; Parish Records of Holy Trinity Church, Hull; Army and Navy Gazette; Naval Review; York Herald; Records of the North Riding of Yorkshire Committee; Personal Correspondence of William Croft; Thomas Wright's notebook; Wills and Probate of the Croft, Faceby and Stainforth Families.